My favorite Top 10 Lakes in the Lake District. 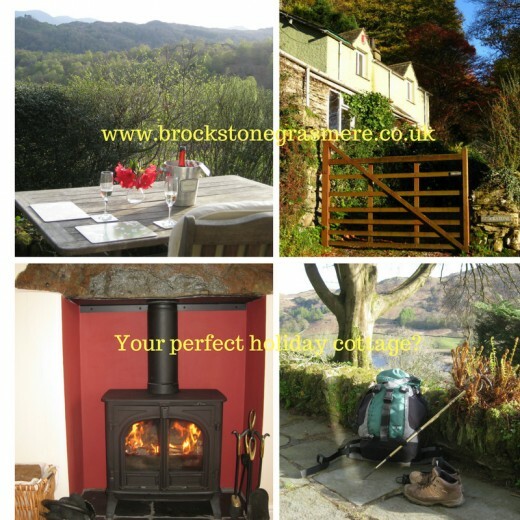 Planning a trip to England's Lake District?. The Lake District National Park, in North West England,is one of the most beautiful places in the world. I'm lucky- I live in Grasmere, in the heart of the Lake District. All the Lakes are beautiful in their own way, but here I've picked my personal choice of the Top 10 Lakes in the Lake District. If you want to vote on your favorite lake, there's a poll below for you to do this. The 19th Century poets, most notably William Wordsworth, Coleridge and de Quincey were inspired by the Lakes of England's Lake District. 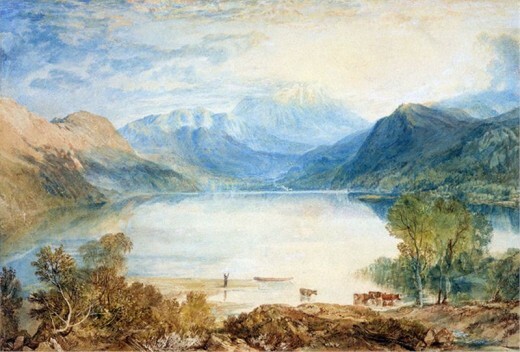 Artists , including Constable, Turner and Ruskin, have painted the Lakes. 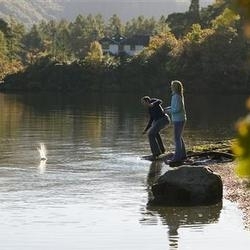 Visitors from all over the world flock to the Lake District for the scenery . 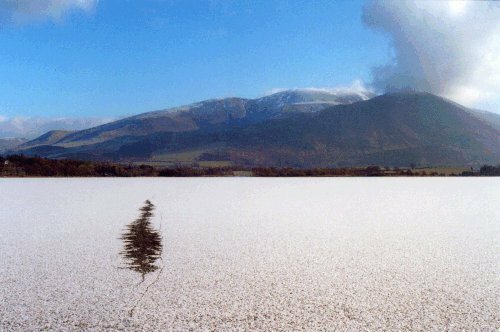 Bassenthwaite Lake is the only Lake to have the word Lake in it's name. 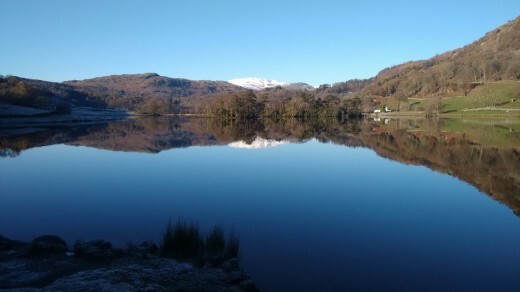 All the other lakes use the old words "mere" or "water", as in Grasmere and Rydal Water. All the lakes in the Lake District National Park are beautiful and each of the Lake District lakes has a special character. It is very hard to decide on a Top 10 Lakes list, but here it is! If you are planning a visit to the Lake District sometime soon, why not leave me a message on the Guestbook- I'm happy to answer any questions. Rydal Water- #1 of Top Ten Lakes in the Lake District. Wiiliam Wordsworth wrote these lines about the perfect small lake of Rydal Water.A 2 hour circular walk round Rydal Water, beginning at White Moss House, taking in Rydal Mount, Rydal Hall, Rydal Caves and Rydal lakeshore is one of the most popular short walks in the Lake District. Click here for more details and photos of the Rydal Walk. I live by Rydal Water, and write from my own first hand experience! If you are planning a trip to the Lake District National Park this spring or summer make sure you have a good map. Here's an excellent walking map to help you around the county of Cumbria, home of the top 10 lakes. Grasmere- #2 of Top 10 Lakes in the Lake District. Grasmere was home to William Wordsworth during his most productive years. When Wordsworth lived at Dove Cottage Grasmere , there were no buildings in front of the house and he had clear views to Grasmere Lake, a great source of inspiration for him and many other poets bewitched by the Lake District. The village of Grasmere lies beside the lake, in the heart of the Lake District. Grasmere Lake has been photographed by thousands of people from around the world. 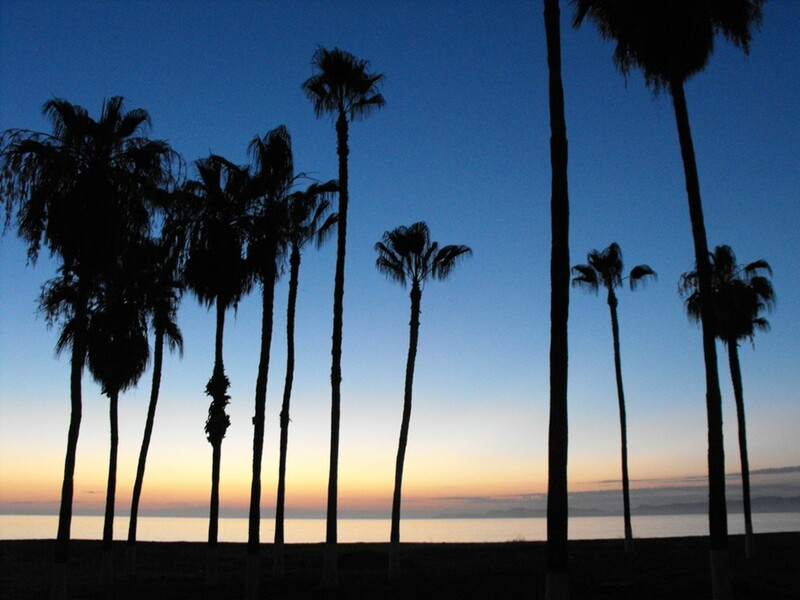 Here is a beautiful Allposters photo you can buy. 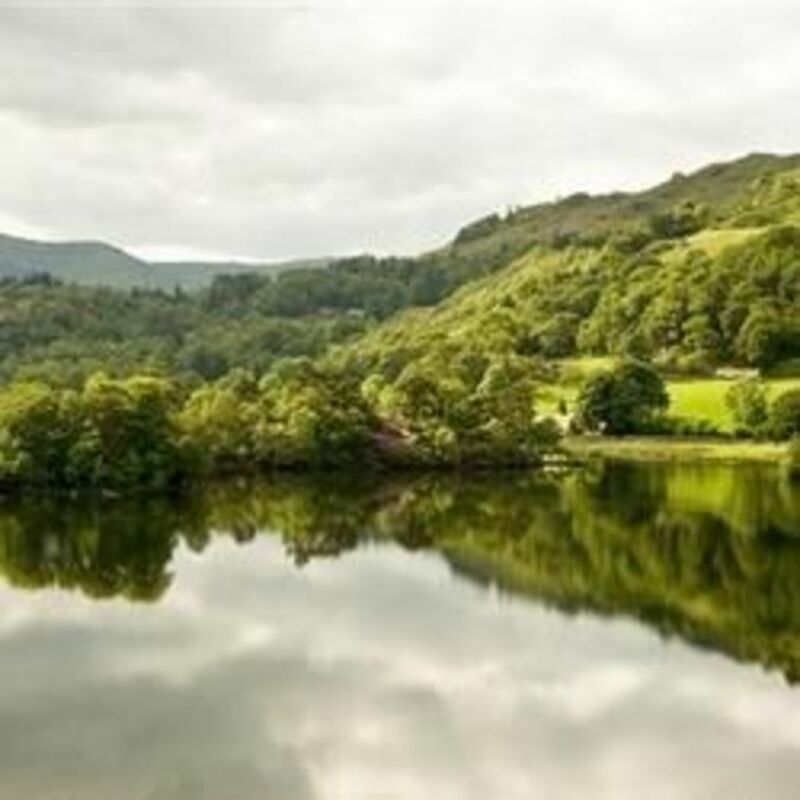 Take a rowing boat out on Grasmere to enjoy the calm magic of this top 10 lake. William Wordsworth Lived at Grasmere and Rydal - Read the poems of the greatest poets on your Kindle. 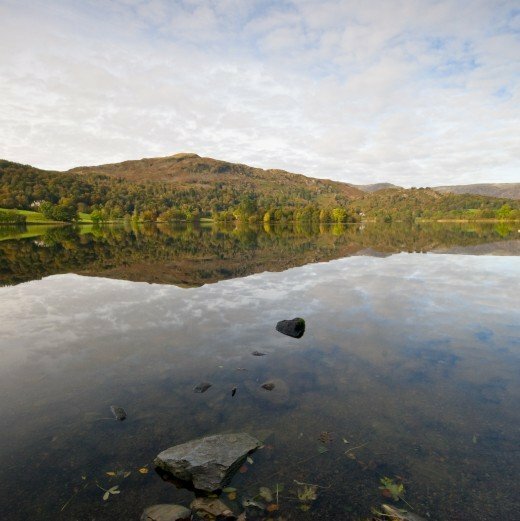 To enjoy the beauty of the Lake District even more, try reading the poems of one of the world's greatest poets, William Wordsworth, who lived in Grasmere and Rydal, and who walked around these two beautiful lakes throughout his long life. This is a classic collection of Wordsworth's poems. Grasmere lies in the heart of England's Lake District. - Where is the Lake District? This map will show you! Windermere- #3 of Top 10 Lakes in the Lake District - Windermere is the largest lake in England. 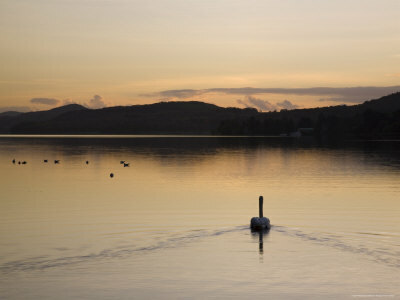 Photo of Windemere at Sunset by Tony West , thank to Cumbria Tourism, all rights reserved.Not for reuse. 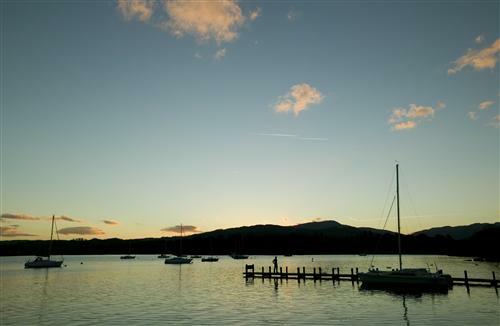 Windermere is 13 miles long, making it the longest lake in England and the Lake District. 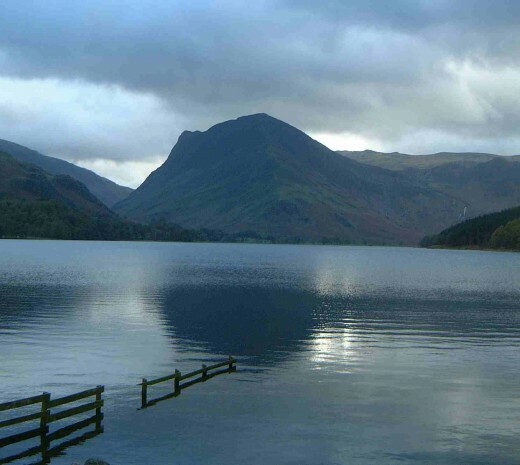 It is the most southerly of the lakes, and the most accessible to visitors. When the railways came through to Windermere in the 19th century, the lake was opened to mass tourism for the first time. These days it is the first lake reached by most visitors, making it the busiest lake. I spent many holidays as a child in a cabin on its shores. I used to love watching the Windermere Steamers ply the lake. These magnificent old boats still run today. A boat trip on Windmere is a wonderful day out. If you're visiting the Lakes, you need a good pair of hiking boots. - Get out and walk in the Lake District- buy your bargain boots here. My friend has just bought some great hiking boots on ebay. Nearly new, hardly worn, and a real bargain. See what you can find before you visit the Lake District. Ladies! Did you know that there are Backpacks specifically designed for women? If you are serious about hiking, you really need to get a properly fitting backpack for the female frame It will make a huge difference to your comfort. Coniston Water # 4 of Top 10 Lakes in the Lake District. This magnificent lake is known for its stillness. It is for that reason the Donald Campbell chose it for his world water speedboat records.Sadly he was killed on Coniston in 1967 whilst attempting to break his own record in his famous boat "Bluebird".The boat is now bsing restored at the Coniston Museum. 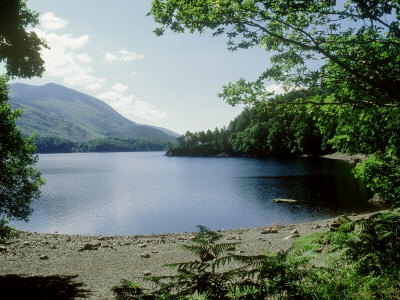 The lake is also the setting for "Swallows and Amazons", the classic children's books written by Arthur Ransome. Along the west side of Coniston run the Coniston Fells, the most famous of which is Coniston Old Man. A really challenging walk, with fantastic views. Derwent Water, sometimes called "the Queen of the Lakes"
Derwent Water in the North of the Lake District is ringed by mountains. The walk along the top of Catbells, on the west of the lake, offers amazing views up the lake to Keswick, and beyond to Skiddaw and Blencathra. Keswick lies at the north of the lake, and The Theatre by the Lake by the shore of Derwent Water is a splendid place to visit. Passenger boats go round Derwentwater from Keswick all day, rather like a circular bus service, stopping along the way to pick up walkers . You can get off the boat, walk a couple of stops along the lake, then hop back on! Ullswater #6 of the Top 10 Lake in the Lake District. Ullswater inspired Wordsworth's poem "I wandered lonely as a cloud..."
Helvellyn towers over the west of Ullswater, with Place Fell on the west. Take the boat from Glenridding over to Howtown and walk back along the shore round the south of the lake. It takes about 3 hours, its mostly pretty flat, and the views are wonderful. From Glenridding drive down past Gowbarrow , home of Wordsworth's Daffodils, and visit the most famous waterfalls in the Lake District, Aira Force. 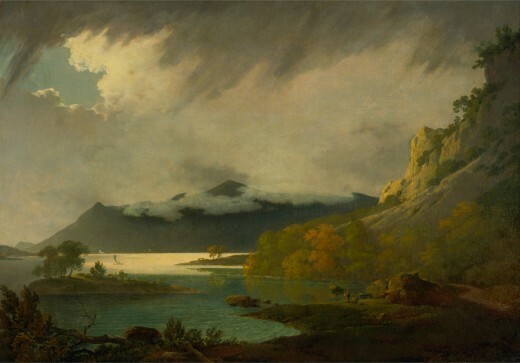 J M W Turner, the outstanding English artist, loved the Lake District and we are fortunate to have his beautiful works that allow us to see these wonderful views through the eyes of the genius that was J M W Turner. Wastwater is the deepest and most dramatic of all the Lakes. Down one side of the lake, the screes run down into the water. Along the other side, a narrow road runs all along the lake, ending at the Wasdale Head Inn and campsite. This is the home of British rock climbing. Started by Victorian gentlemen in Tweed jackets and hobnail boots, this daring sport now has a huge following . The clothing these days is lightweight and high tech, but the challenges remain the same. This splendid photograph "Winter reflections Wastwater" is by Stewart Smith, a brilliant local photographer who has given me permission to use his photos. 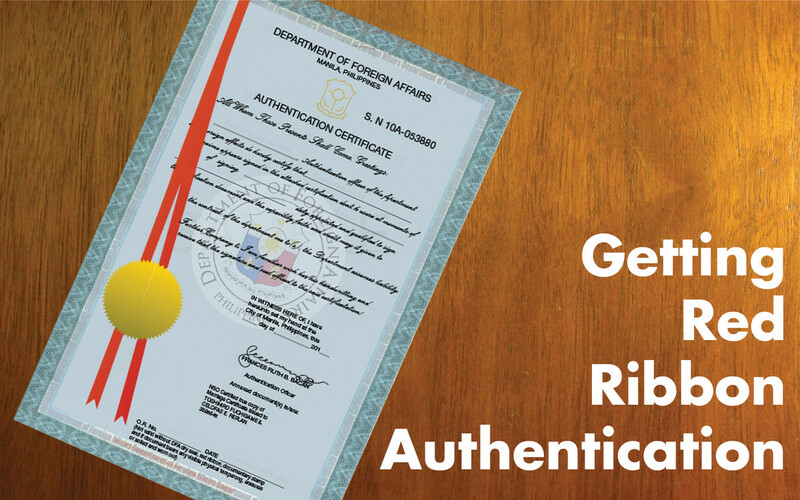 All rights are reserved, and you may not use this photo with permission. If you would like to buy any of Stewart's photos, visit his website , Stewart Smith Photography. Prints can be ordered onlne, and can be shipped in the UK or overseas. A great gift idea! Want to know what's going on in the Lake District? - Check to see what's happening in the Top 10 Lakes. The Lake District has its own newspapers that you can read online. Take a look at what's happening the the Lakes. Published every Thursday, The Westmorland Gazette has all the news from the South of the Lake District and South Cumbria. Published in Kendal. Published in Carlisle, the News and Star keeps you up to date with what's happening in the North of the Lake District and Cumbria. The only man made lake on my list. In the 19th Century the city of Manchester needed a water supply for the masses of people who had flocked to this huge city following the Industrial Revolution.An Act of Parliament was passed, allowing the Manchester Corporation to flood an area of the Lake District where two smaller lakes existed. A village had to be evacuated, and the residents relocated. The first water arrived in Manchester on 13 October 1894. It travels all the 100 miles by gravity, taking nearly 2 days to arrive. It is carried in the Thirlmere Aqueduct , a magnificent engineering achievement, which still supplies 1 million Mancunians a day with superb Lake District water. Beautiful Buttermere-"The lake of the Dairy Pastures"
The village of Buttermere is the popular place to start a variety of walks. One of the few flat walks in the Lake District is a fascinating circular walk round the shores, stopping for a swim in warm weather. Higher level walks up Red Pike, Fleetwith Pike, or Wainwright's favorite mountain, Haystacks, can all be done form Buttermere Village. The Fish Inn at Buttermere was home to Mary Robinson,1778-1837, know as the Maid of Buttermere. She was said to be a stunning beauty, and became a tourist attraction after the Romantic poets sang her praises.Her story is told in the book by Melvyn Bragg. Bassenthwaite Lake- the home of the Ospreys. Bassenthwaite Lake in the North of the Lake District stretches west from Skiddaw mountain towards to coast. 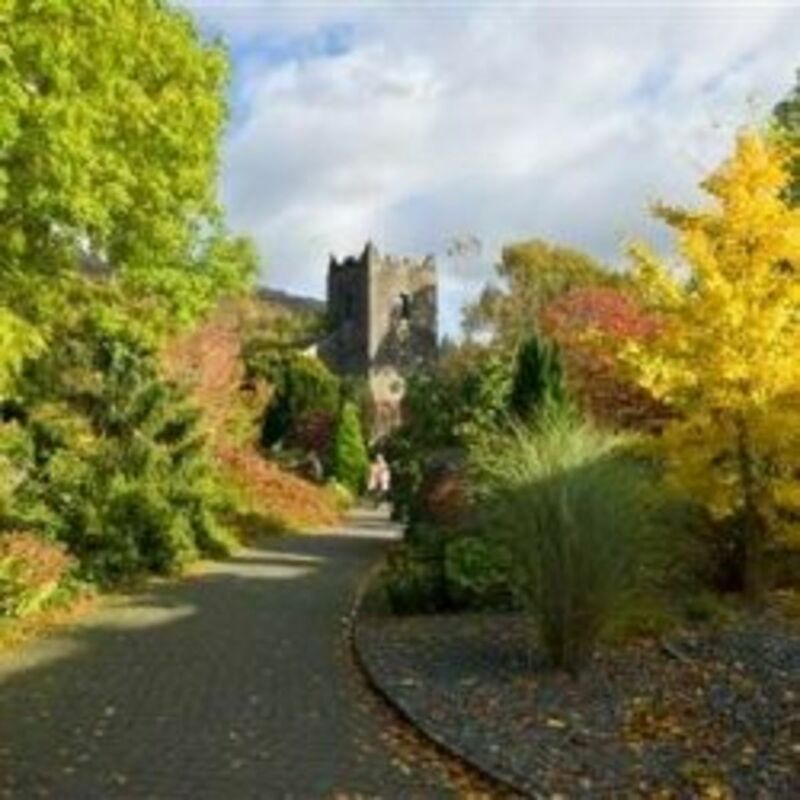 In recent years it has become the centre of a pilgrimage for bird watchers. In the early 20th Century Ospreys had become extinct in Britain However, in recent years, a nesting pair of birds has returned to Bassenthwaite Lake. Every year now an Osprey Watch is mounted by the RSPB, the Lake District National Park and the Forestry Commission to protect the birds and their chicks. Live webcams monitor their progress, and a visitor centre has been set up so that they can be observed at a distance through telescopes by bird lovers.Its amazing! 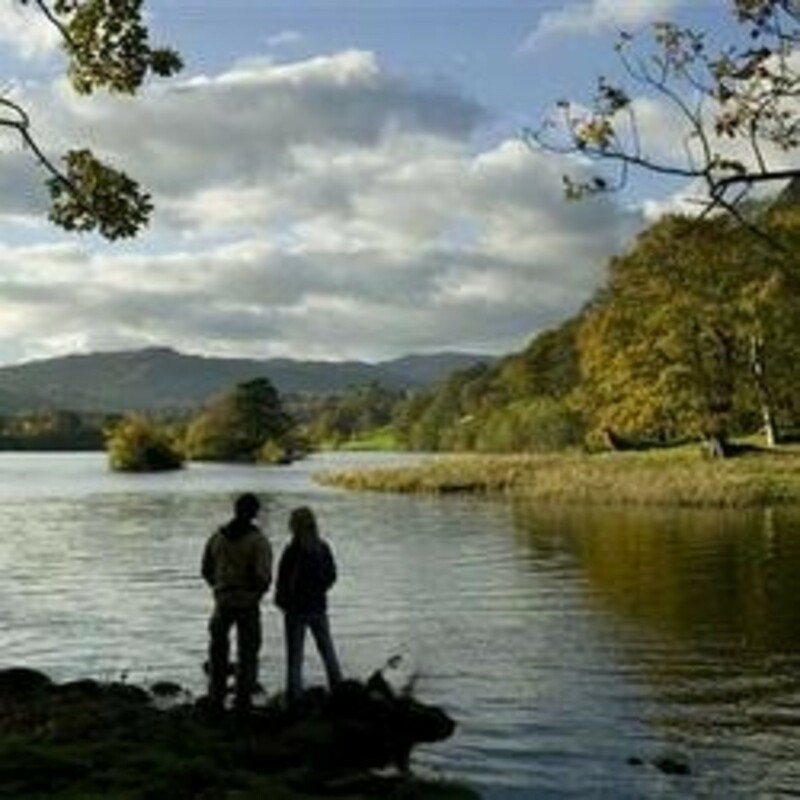 Vote on your favorite lake from the Lake District - Top 10 lakes in the Lake District. Its hard to make a choice. All the lakes are so beautiful. Which is your favorite Lake District lake? If you are visiting the Top 10 Lakes, here are some useful links - Are you planning to visit the Lake District? 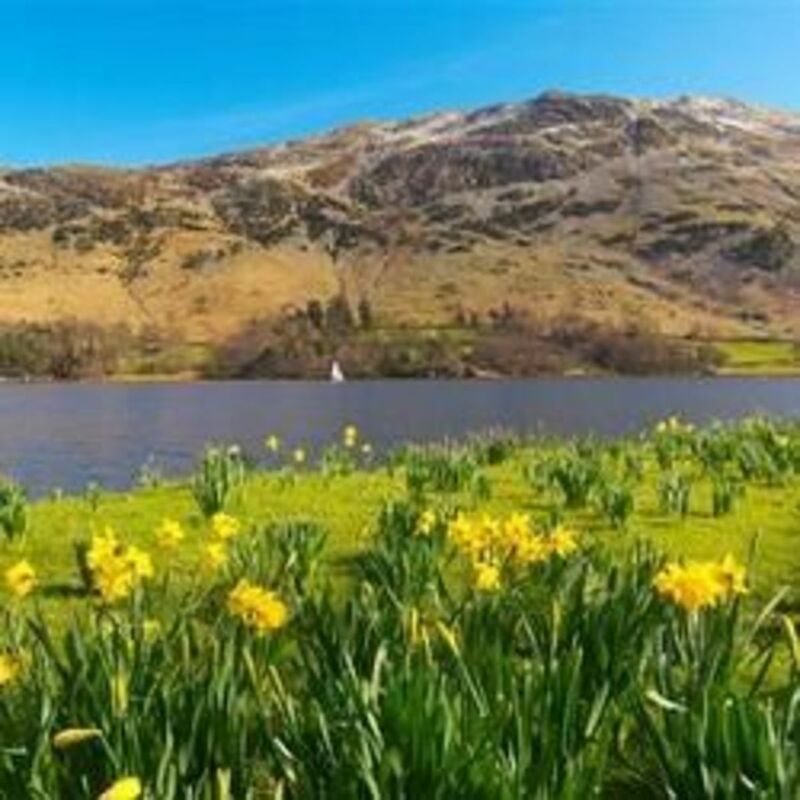 If you are thinking of coming to the Lake District to enjoy the fabulous lakes and mountains, here are some linke that you might like to look at for more information. I've picked a YouTube video of every one of my Top 10 Lakes in the Lake District- please take a look and enjoy! This could be the perfect location for your stay in the Lake District. Stay in a beautiful Lakes cottage- owned by your author! I hope you enjoyed this tour of 10 Lake District Lakes - It was a hard choice to decide which were my top 10 lakes- do you agree? @smarterdigital: I don't think anyone ever looked at it before! I love it! Thanks for your comments. Lovely lense. There's a strange guy at the end of the Grasmere video, though! Yes, it was such a hard choice to decide which was the top 10. I definitely will check out all of them if time allows it. What a wonderful lens. This makes me yearn to repeat the many holidays I have taken all over the Lake District. I wonder if the Pheasant at Bassenthwaite Lake is still there? You can't beat the Lakes for romance! Love the lens! I personally like Derwent water, it's great for a day out and you can walk Catbells all at the same time. They're all special though! Lovely - makes me homesick. I need to go for another visit sometime! i loved this, thank you! I'm coming to the lake district from New Zealand to see the setting of the Swallows and Amazons, is Windermere the best place to stay in? Haven't been to the lake district for years. Must do something about it. Blessed. Some lovely photos showcasing these lakes. Wordsworth's house in the lake district ? Wow ! Let's start a travel exchange club ! Congrads your Squidoo level 61. Conversations helps generate new ideas. Thanks. I have always wanted to visit the Lake District but have not made it yet. However, when I do, your lens will be an invaluable resource! Thank you. I can't wait to travel. I love lakes, so this would definitely be a choice to visit. Good job. i've never been down to the south of argentina but i hear they have a great lake district down there...have u been? I used to enjoy living on a lake, not as gorgeous as these but still wonderful. Now I live on a pond which in Florida they call lakes. I still love the view and the wildlife. Nice to see another Cumbrian! I live near coniston, woodland valley. That "Winter reflections Wastwater" is absolutely stunning! Very nice page. This is a great lens, which really made me want to go to the Lake District. I'll have to do some research and see when it's possible. Thanks for sharing! All of these lakes are beautiful. Thank you for publishing this lens. This is a great lens I like the information and will be coming back to read more of your work. What amazing pictures! It looks so peaceful too. Hope I get the chance to visit this area in person -- I've been to London but this just takes my breath away. Breathtaking scenery. I would love to see the Lakes in person, but this is a great alternative. Thanks for the Lake lenses. Gorgeous pictures and posters! Must be breathtaking in person. Lovely! I haven't visited the Lake District for years; I'd forgotten how beautiful it is. No, there's no way to choose a favourite! Lakes, pond and rivers view give me positive energy, so this lens is one of my favorite. Beautiful lakes and beautifully presented. I'm nature lover like you. It brings back some good memories, especially of Keswick. There are some very beautiful photos on this page, but if anyone hasn't visited then they should as it's even more beautiful in person. I have fond memories of our extended trip to the Lake District in the mid 90's... lovely pictures. Thank you for sharing. The pics were so idyllic - i agree that it is a hard choice to decide which are my top ten. What a lovely lovely area! I would enjoy visiting each one, but especially Gowbarrow , home of Wordsworth's Daffodils. I am traveling around the world this weekend via Squidoo and leaving you a very special squidangel blessing. Thank you for the visit to the Lake District Lakes. Beautiful pictures. I bet it's been packed in Grasmere this weekend! A great lens - well written and a nice local perspective. Mind you, I still think it should include Tarn Hows! Must go back soon - too many years have passed. These lakes are stunning. Thank you for sharing. Beautiful lens! Blessed by a Squidoo Angel on 12/14/2010. Have a great day! Those are some truly beautiful images from the Lake District there. It is almost criminal that I've never visited the place, perhaps I will on my next big holiday. Anyway - a great lens, and I love the pictures. Wow, super cool lens with lots of great pictures! Nice job!!! Very informative lens. I have never been to any of these lakes, but yearning to see these lakes. Lakes are really one of the gift from the nature for human beings. they may be due to results of catastrophic historical events, but they are one of the attractive places for vacations where anybody would love to go. Beautiful collection ! I am from Atlanta Web Design Services thanks for sharing. @RaintreeAnnie: Thank you for your visit and comments. @RuthCoffee: Thanks mulberry. I like the new videos too! Lovely, each and every one. The videos are a nice addition. @reasonablerobby: You really are a Lakes fan RR- thank you for your visit. @NanLT: Make sure you come and see us when you visit! Bassenthwaite is a favourite of mine. I spent two weeks on a course at Higham Hall. Also took my lads to Elterwater fly fishing when they were young too. 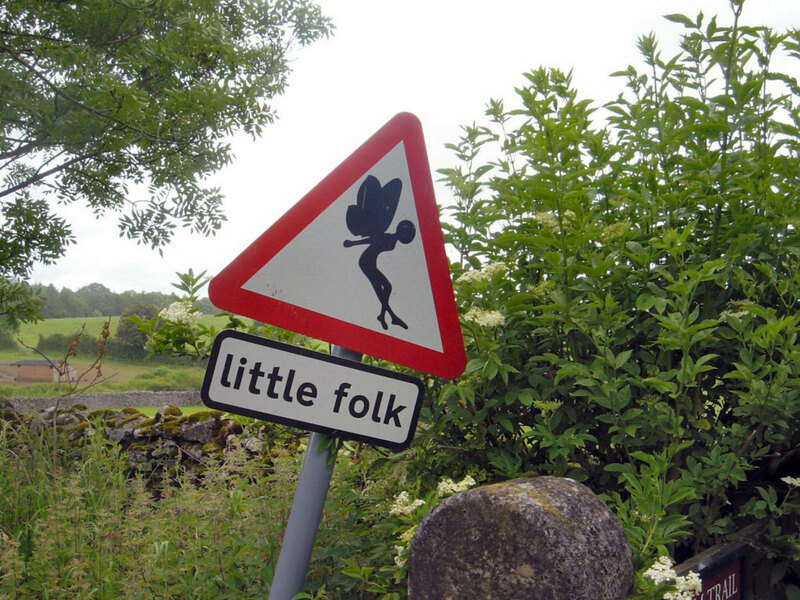 Another area of England I would love to visit one day. Great lens, I envy you for living in such a beautiful landscape! @ajgodinho: Thank you very much, gald you emjoed your viisit. Beautiful lakes - I was trying to figure out which one I like, but I like 'em all ;) - great connection with William Wordsworth as well...nicely done! All the best with the Giant challenge! What a beautiful place, and the pictures are breath-taking. I would love to visit England some day. 5 Stars, lensrolled and on my way to feature this on Nigel Kennedy lens. ~ Very lovely indeed! Great Lens - and what superb photos! I think the whole area holds such beauty. 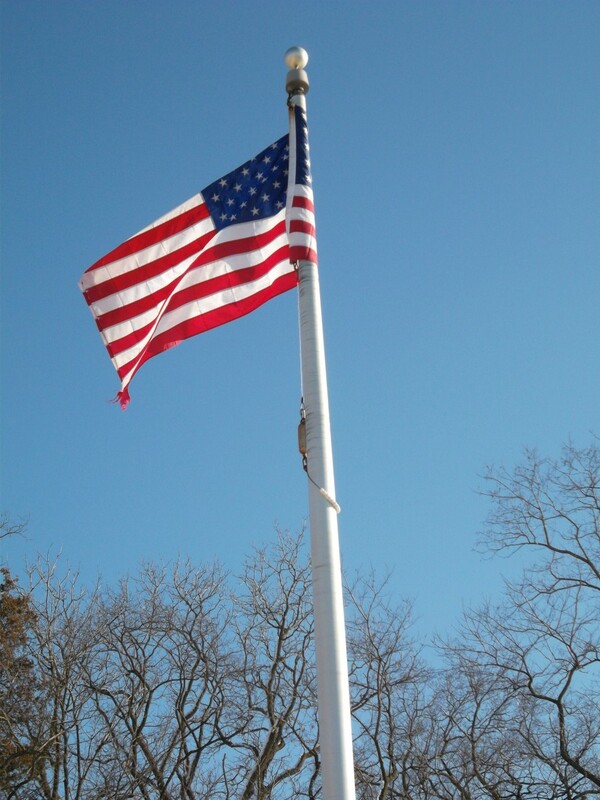 @clemency lm: Thank you- I hope you cal in when you make that visit! What a beautiful lens. I am ashamed to say I have never visited the Lake District before, despite living not too far away! You have inspired me to. It looks so beautiful there! Thank you for sharing this with us! WOW! Awesome lens. I love # 1. That is a very beautiful picture.I would love to visit some day. Wonderful - very informative and a beautiful selection of images. I can't believe I haven't yet been to the Lake District. It's on my list for 2010 - and I know where to come when I'm planning my trip! @Spook LM: Thank you kindly sir for your visit, and your blessing. Very much appreciated! @Kiwisoutback: Thank you very much for your visit and your blessing! Friday 13 November not unlucky! Beautiful, I was sure I had been to this lens before. Obviously not, strange, but better late than never. Blessed by an Angel. I've never heard of this area, but it looks incredible! Well done, Squid Angel blessed. Thank you Paul and Mary Beth for your kind words and blessings. I love the Lake District and it's a while since I've been there. 5 stars and favourited! This is such a beautiful lens! I've never been to the Lake District...it is definitely on my list on our next visit to the UK! We have friends that live in the southern part of England by the Wales border so we visit every few years. 5*****and blessed by a SquidAngel!! A special thank you to four Angels- Susanna, Crystal, Heather and Alison for your blessings. I'm so happy that you enjoyed this lens. Crystal- thank you so much for introducing me to Rocketmoms- its been great! Blessed by a new squid angel today. I loved this one and had to come back to bless it. Gorgeous - you did a really good job on this one! Beautiful lens! The lakes look great. I would love to visit any of them. You lucky duck. Living in such a beautiful place. If I ever get back to England the Lake District is on the top of places to visit. Your lens just reinforced that idea for me. Thanks for a beautiful lens. OMG, what a beautiful lens!!! The Lake District has always fascinated me and this lens is a wonderful incentive to get there soon! 5*, fave, lensroll. Great job! It is a long time since I have visited the Lake District but I have fond memories of it - a beautiful place. Angel Blessings to you for a beautiful lens.